THE LOWDOWN, UNREAD, TIMMY THE BLOGGER BLUES! One of the cool things about WordPress, and I am sure other blog sites do it to, is that my statistics are tracked on a daily basis. Ideally, I suppose, the astute blogger looks at these stats and tries to figure out ways to improve the blog so he or she gets more readers. I am not yet at that point in my blogging experience. I have contented myself in just seeing how many people have read my blog. I am very grateful to those who do choose to read my little blog here. My hope is you find it amusing and insightful. Amusing, because I do try to write in a humorous style and give a chuckle or two to the readers. Insightful as I am trying to give readers, and hopefully potential customers, a basic look at who I am as a person. Everyone who hangs a shingle as a photography has some skills in the medium. So many times it comes down to whether a bride likes someone or not. I have heard a photographer talk about getting a client because on their blog they mentioned their dog. And the customer liked that kind of dog so she picked that photographer for the job. Hint…hint…brides to be who are Minnesota Vikings fans…just sayin’. So I skipped Friday blogging, but made up for it yesterday. For the first time in about 2 weeks, I really didn’t struggle to find something to blog about. It was like when my college English teacher finally picked a topic I was enthusiastic about and I couldn’t wait to write the paper. So last night I spent about 2 hours writing the blog and uploading the photographs. When I finished, I was stoked. This was the blog I wanted people to remember me by, it was that awesome! I couldn’t wait to check today’s stats. “The Gunfight at the Cadillac Ranch” was going to go viral, baby! As of this moment, “The Gunfight at the Cadillac Ranch”, my blog that would quite possibly change the world of blogging as we know it, has been viewed by….. drum roll please…. no one. Ah me. I feel like the high jumpers I used to coach that set the bar high, only to hear the clang of the bar as they missed the jump. That’s me. I am now laying on the high jump pit of life, looking at the sky and feeling the cool breeze gently blow over me, the leaves in the distant trees making a rustling sound. As I lay here, I remember the days of my childhood where win, lose or draw, we always got taken to Dairy Queen. I think I would like a Dairy Queen cone right about now. 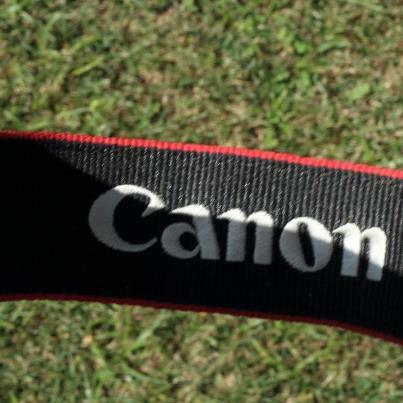 As I lay on the high jump pit of life, waiting for someone to spring for a soft serve cone, I am reminded of the time that I accidentally took a picture of my Canon camera strap. I had forgotten my camera was set on 10 second delay. So I am taking this picture, and nothing is happening and I am staring dumbfounded at the camera and then I hear it go click. As a lark, I posted that picture on my (*shameless self promotion link alert) Poole Photography Facebook page. Now normally my posts on that site average 30-40 views. My Canon strap picture had 201 views. So what am I to conclude from these two anecdotes about those two media posts? I conclude that if there is ever a market for photographs of camera straps, I am in. I will corner the market. No others need apply. This is one of the other photographs I took at the Wild West Festival. 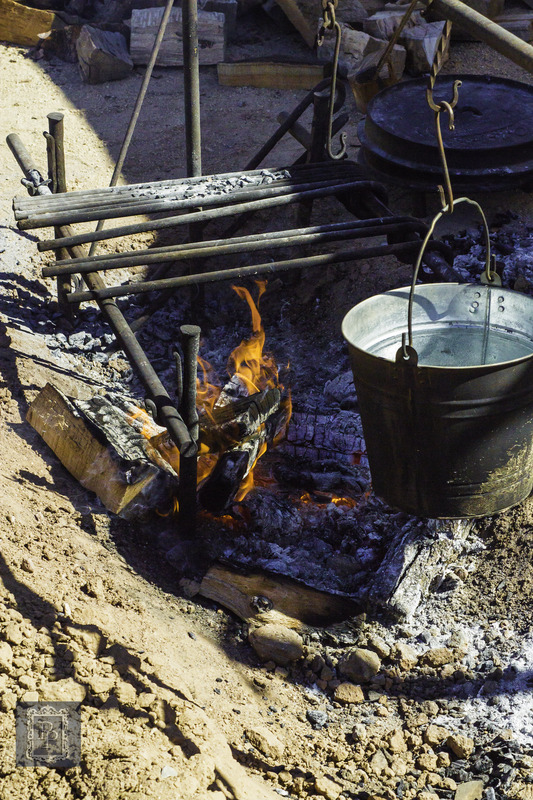 This fire pit was next to the traditional chuck wagon that was on display. I like the textural content as well as the juxtaposition of the linear items in the composition. I just want to clarify a couple of points I made in this blog. The high jump bar does not clang when it gets knocked off. The crossbars have not been made out of metal in years. But saying “they hear the thump of the bar” just doesn’t seem to carry as much visual and audio energy into the story. For you brides to be that are dog lovers…I am a dog lover, too! Right now, I have two cats in my house. You know that old saying, “Dogs have owners, Cats have staff.” My cats have yet to give me written permission to get another dog. And If you are a cat loving bride-to-be…you understand my plight.